As an artist, I have for many years devoted myself to a celebration of a much greater Poet and Artist David Jones. My work is a tribute to him and to those who die in all Wars. 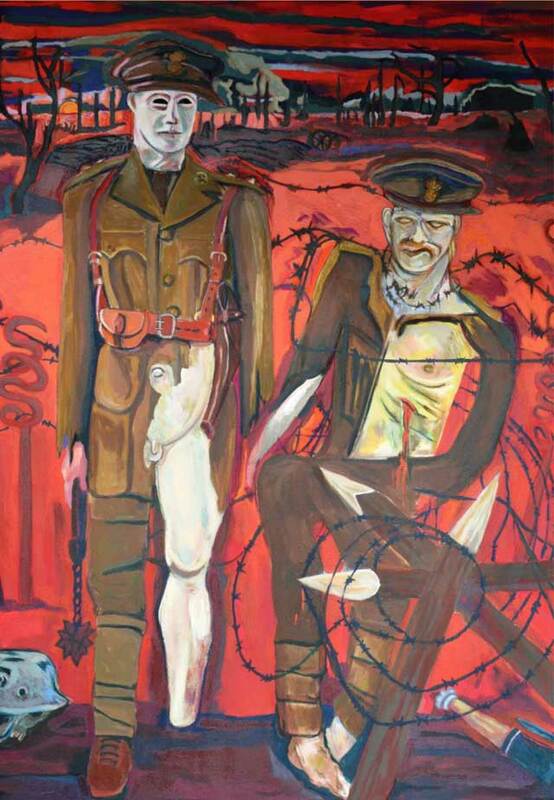 David Jones, was a WW1 Veteran, an Artist and the Author of the epic, Great War Poem, In Parenthesis; which T.S. Elliot ranked as the Greatest War Poem of that War. In it Jones brings alive his experience as a Private in the 15th (London Welsh), Royal Welch Fusiliers part of the 38th Division, ‘Lloyd George Welsh Army’ who were to be sacrifice in a day-light frontal attack on Mametz Woods – half were to become casualties (including Private Walter .David .Jones), a quarter were to die (of whom most still lie under the new grown trees of that dark haunted wood. I first read In Parenthesis in 2003 and was so inspired by it to then read everything I could on Jones art life and poetry. Jones was a somewhat neglected artist and poet in 2003 but thanks to the tireless champions he has found in the David Jones Society and its members, Anne Price-Owen, David Shiel, Paul Hills, and Rowan Williams he is slowly and rightly becoming as well known and venerated as, Owen, Graves, Sassoon, and the other WW1 poets and artists of Officer rank. Harrow Arts Centre, Gallery, from the 1st November -30th 10-5 pm. On the Afternoon of the 11th November, I will be giving be a 20 minute Gallery talks at 1pm, 2pm and 3pm and I will answer any questions. N.B. This is as part of a wider Commemorative Community Events at the Centre on the afternoon of the 11th of the11. Part of a range of events throughout Harrow sponsored by Harrow Council: which will include a range, the creative arts, from all members of the community, young and old, See HAC website for details. See the Council and HAC’s website more details. I am also honoured to be asked to exhibit at two ‘Quaker’, The Society of Friends , events: At the Friends, Meeting House, Uxbridge my work will be shown from the 7th -10th 2-4pm and at Hounslow Art Centre from the 3rd -20th November.There will also be a talk by me with the work been shown, in the Friends Meeting House, Uxbridge at 3pm.